4_x_5_Labels is rated 1.0 out of 5 by 1. Rated 1 out of 5 by frustrated from No microsoft word template The packaging says you can use it with Microsoft Word by putting in custom dimensions but there is no longer a "custom" option in Microsoft labels and there is nowhere that I can find online to download a template; this is unfortunate because these were the only 4x5 labels I was able to find. If you go to our template page and download the 4 x 5 labels, you can find the margins there! Thanks! Whether you need to label your storage bins, need some name tags for your next event, or need to start decorating your school supplies, these bright labels are versatile enough for any situation. All you need to do is peel them off and stick them on! It's as easy as that to get as organized as possible. Best of all, you can print on these with your home computer, so labeling is easier than ever. 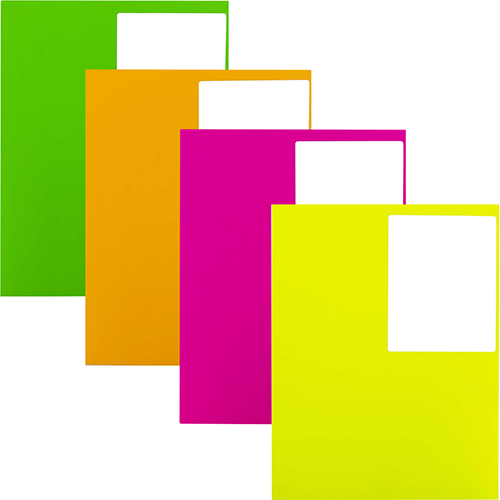 Choose between our five different neon colors for a bright attention grabber. These are especially great for when you can't seem to find that one storage box in that obnoxious attic of yours. Or go for our subtle white or brown kraft labels for the more classic look. Either way, these labels will stick onto any item and stay on! 4 x 5 labels come in: White, Neon Yellow, Neon Red, Neon Green, Neon Pink, Neon Orange, and Brown Kraft.